While the Bolton Valley area is best known for the 1966 alpine ski area development, it was nearly home to another alpine ski development near two decades earlier. 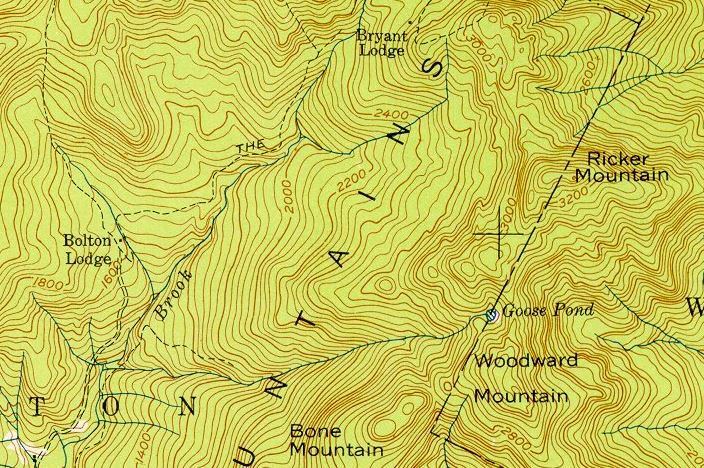 Soon after World War I, Edward Bryant ended up in the Bolton Valley area and was soon a leader of the Bolton Mountain Club. A ski enthusiast, Bryant brought in Otto Schniebs to help cut the Heavenly Highway and Bolton Mountain trails circa the late 1920s. Circa 1927, Bryant Lodge (known today as Bryant Cabin) was constructed near the saddle between Bolton Mountain and Ricker Mountain. The Bolton Lodge was likely constructed in 1928. With lift served skiing taking off starting in the late 1930s, Bryant looked to bring Bolton Valley in the mix. Following World War II, Bryant apparently attempted to get financing to install a rope tow and construct a nice base lodge. His efforts were unsuccessful and soon he found himself in failing health. Bryant passed away in 1951 with his property likely ending up in the hands of a logging company. The much larger present day Bolton Valley ski area was likely built in the same vicinity as the 1940s proposed area.
" After World War II, which put a crimp in his ski area development plans, Bryant tried but failed to get financial backing for a rope tow and base lodge. Bryant died in 1951. " "Pair Skiing With History At Vermont Ski Resort." St. Petersburg Evening Independent. 20 Jan. 1981.